Multi Panel Canvases. Create Your Own Multi Canvas Prints. Add a stylish addition to your home or create a striking piece of work for an art exhibition with your own multi panel canvas prints. Framed canvas prints offer a contemporary alternative to traditional photo framing. Display your photos in a creative fashion with our professionally printed and long-lasting multi-canvas prints. Multi-panel canvas prints create a unique look wherever they’re displayed, and give a singular photo a new and impressive style. We create sharp and richly coloured reproductions of your designs using a sublimation printing method, showcasing your photos on sustainable materials. Your bespoke design will be hand-stretched on FSC certified pinewood frames. Crafted by hand onsite in the UK, our professional quality wooden frames won’t warp or crack over time. We want to ensure you remain happy with your custom multi panel canvas print, so we offer a lifetime guarantee to keep you smiling for years to come. Get creative and design your multi-panel canvas prints using our simple online tool. Just upload your photos and immediately begin visualising your new work of art! Choose from a huge range of sizes as well as the option to add text, photo filters, or photo montages. 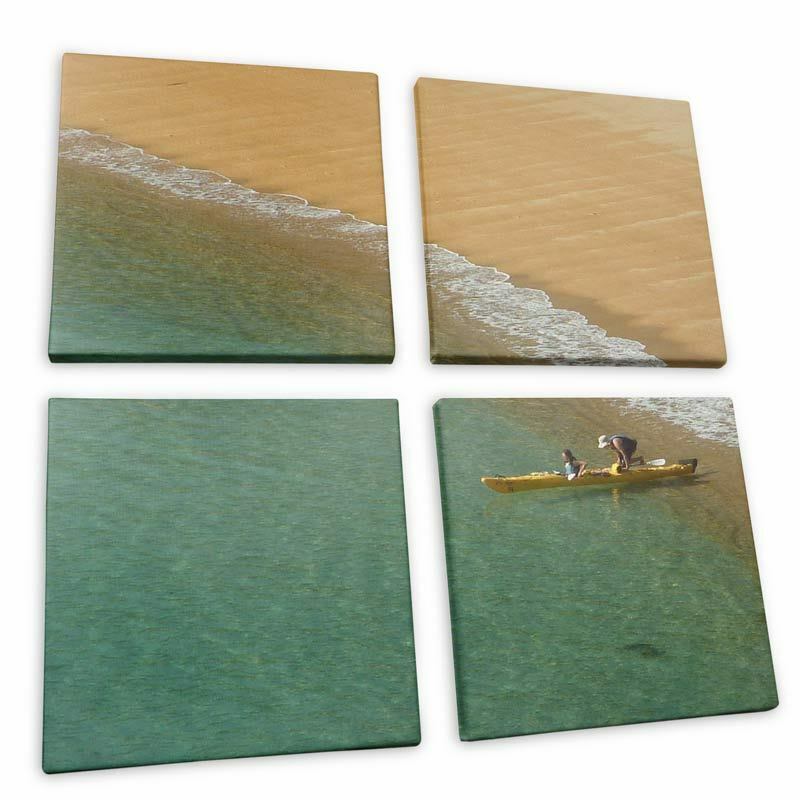 Each of our multi-panel canvases comes in a set of four equal sized square canvases. Choose from five different sizes for your multi-panel canvas prints, ranging from 30 cm x 30 cm to 100 cm x 100 cm. Displayed as one large square, your image will make a striking impression when split over these four frames! The depth of your multi-panel canvas prints is our standard 2.5 cm depth, lightweight yet still strong and warp-proof. If you opt for a larger size, your canvas will be produced on a 4.5cm thick frame for extra support. Using a heavy 300 gsm canvas fabric, we present your photos to the highest possible standard as stretched multi-panel canvases. The 100% poly material has a natural grain structure and gives your designs a gently textured finish, with an even grain and no inconsistencies. Unlike pure cotton, the polyester remains strong over time and won’t weaken. Each wooden frame for your multi-panel canvases is crafted by hand, onsite in the UK. This allows for quality checks throughout the process and for care and attention every step of the way. Our laminated pinewood is FSC certified and knot free, preventing warping or cracking in the future. A high-quality sturdy frame will ensure your prints look fresh throughout the years. We use a professional quality sublimation printing process to produce your vibrant multi panel canvas prints. This process interlocks the ink with the canvas fibres, rather than laying the inks on top of the material. The result is an incredibly robust print which remains scratch proof and crack-free and can be easily wiped clean or washed. With beautiful colours, an even tone and sharp detail, your multi-panel canvases will always look vivid and new. We always use the highest quality materials, sourcing environmentally friendly inks alongside our sustainable wooden frames. Our products and processes follow an eco-friendly approach, to give you peace of mind as well as superb quality canvases. To preserve your stunning design, please keep it out of direct sunlight. With multi-canvas prints, the wrap choice is even more important in ensuring you don’t lose valuable parts of your design down the canvas gaps. The wrap is the sides of the canvas that usually have imagery printed on, or are left blank if you prefer. Easily select your wrap option when you “Start Design”. For a sleek and contemporary look, choose a mirror or gallery wrap where the image is reflected or extended over the canvas edges. We also offer a colour wrap for a simple yet classic look. Multi-panel canvases can be swift and easy to hang, especially with our ‘ready to hang’ kit which comes free with every order. Affix the picture hooks to the backs of your wooden frames, and hang on your wall. Wall plugs and screws are included. The wrap choice is particularly important when creating multiple canvas prints, to ensure no important parts of your photo are lost down the canvas joins or gaps. If details in your multiple canvas prints images will be near the canvas edges, for example, if people’s heads are near the joins, a coloured wrap or no wrap would keep the image from distorting. Gallery and mirror wraps can effectively enhance a landscape or cityscape photo, where large areas of scenery or buildings will be near the joins and the image continuing over the edges won’t lose important details. The bleed is the area in the design process where leeway is left for printing. The bleed will likely be cut off from your final print, but ensure you still fill in this area as it may be visible on your finished design. If you’re wanting to jazz up a simple single photo, multi-panel canvas prints are a sophisticated yet exciting way to create a lasting impression. Dynamic photos such as action shots or scenes from special events work well spread across the four frames, particularly with creative filters added from our photo studio. Try decorating your home or office with a few sets of abstract multi panel canvas prints. These can help tie a colour scheme together, as well as creating focal points around the room. By displaying your photography across multiple canvas prints, the eye will be drawn around the design, allowing for viewers to gain even more appreciation for your artwork and skills. This is an effective way to display photography in a group exhibition to help your work stand out from the crowd! The four canvases also draw focus to symmetry within the image, which can look particularly striking for scenery or minimalist pieces. 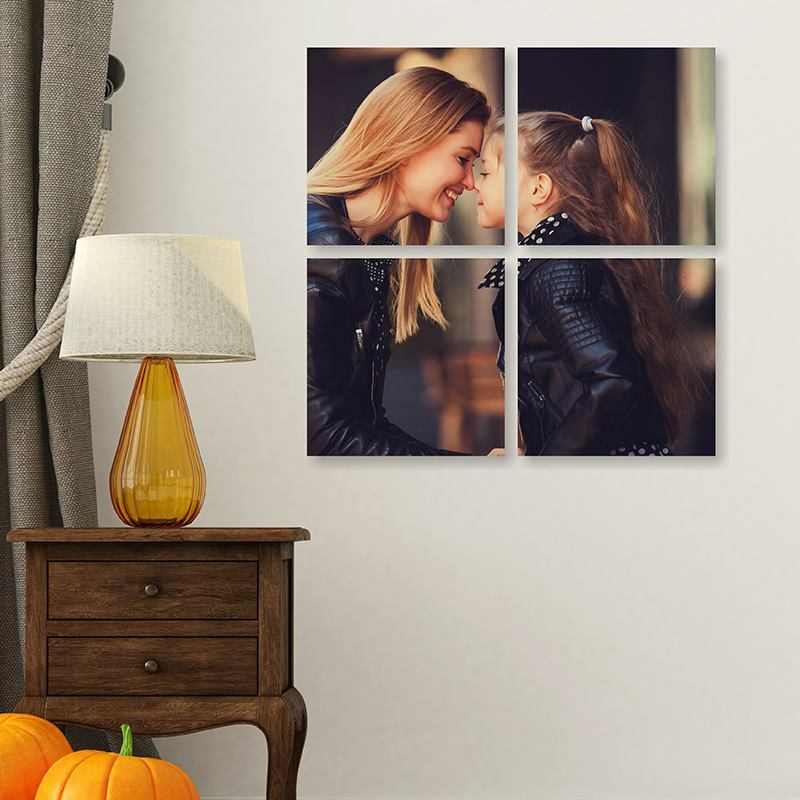 If you’d prefer to show more than one image on your multiple canvas prints, you can get creative with our photo montage option. Simply upload multiple photos, then choose a design display to suit you. Try adding some photos from a memorable event such as an anniversary party or special holiday, which can then be displayed scattered around the canvases. Deck out your home with a few different sets of multiple canvas prints for an added wow factor. Display three bold and beautiful images over three sets of multi-panel canvas frames with our 3 for 2 offer. Buy two and receive the third entirely free. The discount will be applied to your basket automatically. Our multi-panel canvases are made to last a lifetime, so we offer a lifetime guarantee with every order to keep you happy well into the future.